The Art Deco Fountain Pen was created with Art-Deco Motif that spanned the 1920's and 1930's. Designed for discriminating collectors in mind, it is manufactured out of the highest quality Black Titanium and 22kt Gold plated components. The body is handcrafted out of select Gray & Black Maple Burl and polished to perfection. Every detail of this pen is a Work of Art. 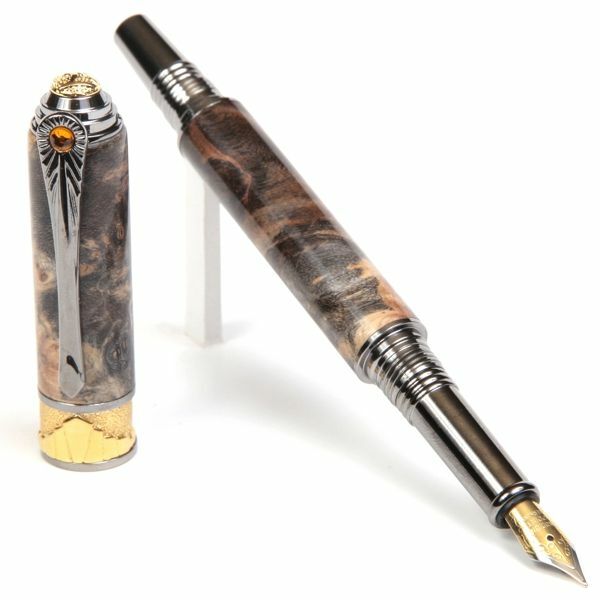 The stunning blend of handcrafted Gray & Black Maple Burl polished to perfection, Black Titanium and 22kt Gold plated components and a top quality German-made two-tone colored nib with genuine iridium point ensures a smooth and dependable writing experience.